While trying out Mario Kart VR et cetera at Bandai Namco’s VR Zone Shinjuku yesterday, I visited the cafe inside the virtual reality arcade. I was about to make a mistake. This, I thought, is a Kotaku blog post. Moreover, it’s curry. I love Japanese curry! I’ve got to, I thought, try this spin on this unofficial national dish. Goodbye, hamburger with your flowing rivulets of cheddar sauce; hello, Pakupaku PAC-MAN’s curry. First off, the black widget that forms Pac-Man’s mouth isn’t even food. It’s a piece of plastic, and it was rocket-hot, as I found when I tried to remove it with my fingers to start eating. This proved impossible, so I had to eat around it. The rice was fine. It was rice. But then I got into the sauce. Japanese curry comes in so many flavors and textures; what would this one be like? As it turns out, the taste was literally identical to the crappiest American prepackaged meat sauce. Like, Italian tomato sauce with ground beef, but the kind you’d get at a school cafeteria or in a tin can. And so I had to sit there and eat what amounted to just a whole plate of meat sauce with a spoon. The whole plate seemed to have been heated under a hot lamp after it was created, which would account for the burning hot plastic and the fact that the sauce that was underneath the Pac-Man was stone cold, which was an exciting new moment of grossness that I didn’t even believe this food could achieve. By all means, go to the VR Zone and play Mario Kart VR, or get into an Evangelion, or ride a Gundam. 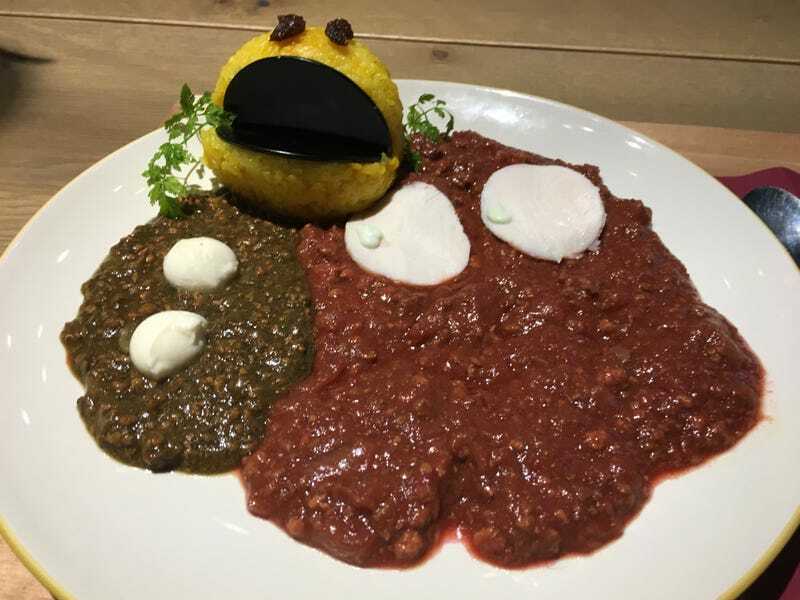 But when it comes time for lunch, do not be tempted by the Pac-Man curry. Pac-Man wouldn’t even eat this, and he eats everything.